Here at Glass Recovery, we specialise in the recycling of glass products. Most glass that are manufactured in Australia actually does not use 100% raw materials. 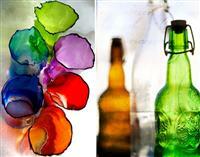 Instead, in most cases a certain percentage of recycled glass often used in the manufacturing process. The main reason why we Recycle glass is that it saves energy. It will save energy for the manufacturers and this can contribute positively to the greenhouse problem. During the glass recycling process, a crushed glass product called 'cullet' is produced. Cullet is often mixed with virgin glass materials and this is done to produce new end products. In fact, making new glass from recycled cullet will save on energy because recycled glass melts at a lower temperature than virgin raw materials. Because the materials do not need to be heated as much, less energy is required in the process. The result in terms of quality is very much the same as glass made from virgin materials. However, this process helps reduce the power consumption and helps with our environment. Hence that is why glass recycling and recovery plays a significant part to the glass industry. Please use the Contact form on the right for Glass Recovery and Recycling information and ordering. Your message will be sent to Glass Recovery Services only. Privacy & Anti Spam protected.